Arunachal Pradesh has become the second state in the Northeast after Sikkim to have achieved the target of being Open Defecation Free. This has been achieved after the remaining three districts – Upper Subansiri, Siang and Changlang were officially declared Open Defecation Free today. 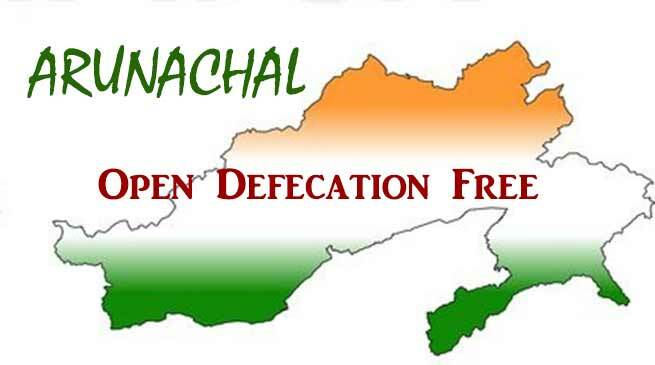 Arunachal Pradesh makes history by getting rid from the menace of open defecation much before the national deadline of 2nd October 2019. The State Government headed by Chief Minister Pema Khandu had cut short the ODF target by one year and ten months ahead of the national target and set 31st December 2017 as the final target to achieve ODF in Arunachal Pradesh. The project undertaken under Swachh Bharat Mission (Gramin) SBM (G) saw the light of day only after the State government extended additional incentive of Rs 8000/- (Rupees eight thousand) only per toilet in addition to state matching share and the support given by Government of India raising the cost to Rs. 20,000/- (Rupees twenty thousand) only. “The herculean task has been possible with the active support of the Ministry of Drinking Water & Sanitation, Govt. of India, constant monitoring by Minister PHE & WS Bamang Felix, Commissioner PHE, Chief Engineers, Deputy Commissioners, PRI members, NGOs, Youths, target beneficiaries, other stake holders and the undying spirit of Team of officials of the implementing agency the PHE & WS Department, Govt. of Arunachal Pradesh,” Khandu said while crediting the accomplishment to the people. It may be recalled that the state Govt. also launched Swachh Arunachal Mission on 2nd October’2017 at Tawang which envisaged the Swachh Protocol (Cleanliness Protocol) aimed at ensuring sustainability of assets created under SBM (G). “I am personally overwhelmed to find people participating in construction of toilets even in remote villages along the international borders like Vijaynagar, Taksing, Pipsorang, etc. despite communication bottlenecks requiring strenuous trekking for days together carrying construction materials along with ration on headload,” Khandu added while congratulating the people and the department of PHE and WS for achieving the rare feat. He said that Arunachal Pradesh is all set to see the dawn of change as dreamt by Hon’ble Prime Minister of India Narendra Modi. A visibly happy PHE & WS Minister Bamang Felix said, “Today we attain freedom from open defecation. We have finally won the battle and liberated ourselves from the open defecation menace. The tiring and rigorous fight against open defecation was a herculean task but not impossible,” Felix said. He thanked the Chief Minister and his cabinet colleagues for the continuous support and the confidence they had upon the department. He also extended his heartfelt gratitude to all the legislators, Deputy Commissioners, NGOS, PRI Members, youths and especially the stakeholders who contributed in their own ways to achieve this target. Giving special reference to the tremendous effort put in by the department officers and officials right from the commissioner, chief engineers, engineers, field staff and preraks from the Ministry of sanitation, Felix said that without their sincere effort this achievement would have been a distant dream. He personally congratulated each and every member of the department for this great achievement. While reminding that the battle is not complete yet, Felix said that the way ahead is more treacherous and challenging. “We have to maintain the status of ODF state and not allow open defecation to raise its ugly head, which is a challenge indeed,” he added. He said it is the matter of sustainability now and we must all work towards achieving this. Felix also appreciated the department for inventing toilet technology which has been a massive success especially in inaccessible areas.